End Caps in the “signal gray” color variant fulfill the demand for a neat, subtle finish to the profile. 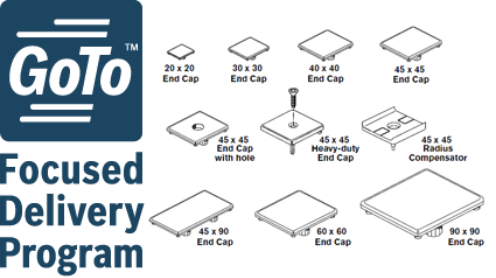 For ESD applications, end caps are offered in the black color variant to ensure visual differentiation. Cover Strips provide a finished appearance to the profile T-slot and prevents accumulation of dirt and debris in the T-slot. End Caps snap-in place into the end of the profile and won’t fall out accidentally. Radius Compensators eliminate gaps and edges created when two profiles are connected in a T-junction. They are ideal for use in clean rooms or any other location where a smooth surface is a must. 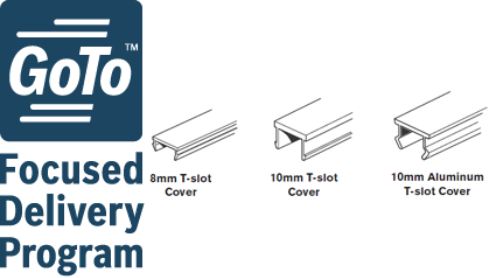 Cover Strips install anywhere along the profile T-slot and are easy to cut to the desired length. Aluminum Cover Strips match profile finish for a clean finished look.